Welcome clay enthusiasts! You've come to the right place to learn more about how my clay classes work. Have a look around, ask questions or sign up for a class. Hope to see you in the studio soon! I have no artistic experience / I'm not sure I'm creative enough. Is there a class for me? Absolutely! Group Clay Classes are perfect for anyone who has a desire to work with clay. I teach basic principles and techniques, which you'll then practice through different projects. You can make these projects as simple or as elaborate as you like! I will be there to guide you through the process, offer inspiration, and to help you find your vision. Is there a group class for wheel work? Some group clay classes include students who have already mastered the basic techniques of wheel work, and are continuing to practice and develop those skills, with my guidance. If your goal is to work on the wheel in a group clay class, your first step is a Private Lesson. This gives me a chance to assess your skills and recommend the most suitable class for you. If you've never worked on a wheel before or have limited experience, at least one Private Lesson is required to get you up to speed and ready to join group classes. What is glazing? How is it different from bisque firing? Bisque firing is the initial process of firing your clay piece, hardening it in preparation to glaze. 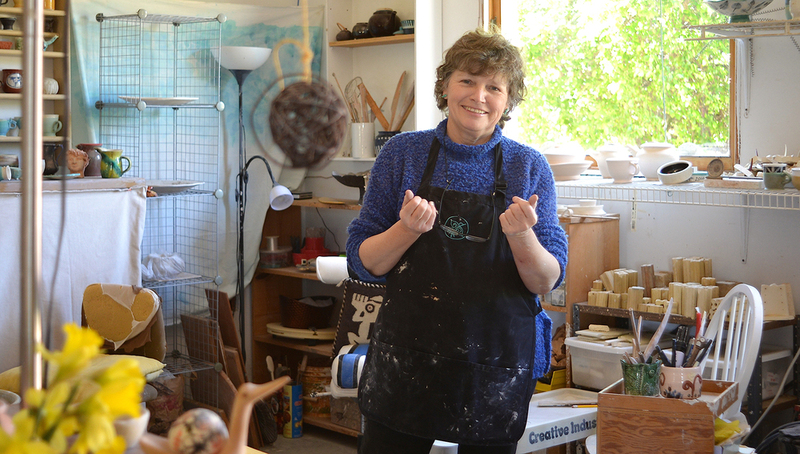 Everyone's finished pieces are bisque fired as part of any Clay Class, Workshop or Clay Party. Glazing is an additional finishing process which can give your clay creation a special color or texture, after being bisque fired. Glazing can also make your piece waterproof and food-safe. Participants in ongoing clay classes will be offered the opportunity to glaze their work as part of the class curriculum, every few weeks. Participants in Workshops or Clay Parties have the option of attending an additional class session to glaze their work, or paying a fee for Kirsty to apply a clear, food-safe glaze for you. Whether you decide to glaze your work or just have it bisque fired, you'll need to come back on a separate day to pick up your work. How do I join a Group Clay Class? Group clay classes run continuously throughout the year, with breaks for holidays and my own artistic development. Classes are available for a variety of age groups and experience levels, and cover a range of topics and techniques. You may purchase one class at a time to ‘drop in’ irregularly, or purchase a Class Pack and attend weekly. Find out more about Group Clay Classes. See the Events for current class times and availability. Can I book time to use your studio, without joining a class? Currently, I do not offer an option for independent use of the studio. During non-class times, I'm working in the studio on my own projects, firing in the kiln and preparing for classes. If you are interested in gathering friends or family at the studio for a Clay Party, I'd be delighted to help you host your special event. Find out more here. If you have a particular project or technique you'd like to explore with more individual attention, a Private or Semi-Private Lesson (2 participants) might be perfect for you! Learn more here. Of course! Gift certificates are available year-round, and may be used towards Classes, Workshops, Clay Parties or in the Studio Gallery. Call me at 310.455.0969 or send me an email to purchase.